matchmycolor is based in Basel Switzerland; it was founded in 2009 following a management buyout of the Colibri® business from Ciba Specialty Chemicals, now part of BASF. matchmycolor brings together a unique offering of IT services and color know-how, resulting in new advanced technical software solutions for the industrial market. Colibri®, one of the most innovative, technologically advanced color communication, color-matching, tinting and color quality control software tools on the market today, has been specifically designed by matchmycolor to meet the requirements of the graphic arts, paints, coatings, plastics, fibers and ceramic industries. Since 2010, ID Creations has been providing graphic design services to matchmycolor, working closely with the Sales & Marketing Director, to support the company with marketing materials which include; company and software branding, brochures, packaging materials, exhibition graphics and website design. 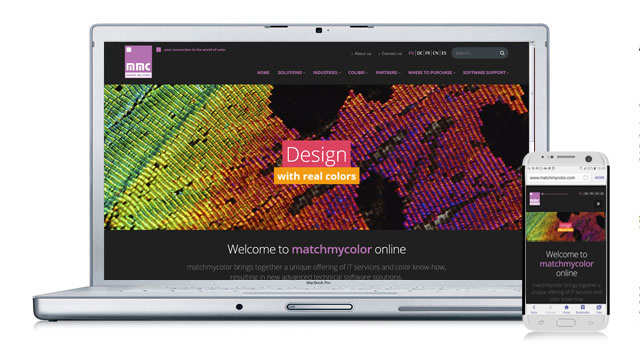 matchmycolor commissioned ID Creations to redesign their existing website to make it responsive, provide optimal viewing and interaction experience. The site needed to be easy to read and navigate with a minimum of resizing, panning and scrolling across a wide range of devices, from desktop computers to mobile phones. ID Creations provided concept visuals for the new design and worked closely with the web development team, Web-Essentials in Cambodia. Once the template pages were created by Web- Essentials, ID Creations created all the pages, content and imagery for the entire website. The end result – matchmycolor has an up to date, modern, clean website that portrays the professional, international company that they are, offering leading innovative color management products. “We are very pleased with our new website, ID Creations once again clearly understood what we were looking for and delivered exactly what we wanted”.